Our SL2 linear servomotors or CMS.. electric cylinders deliver the necessary linear movement in highly dynamic automation systems. What’s more, the SL2 series eliminates mechanical transmission components and wear parts. Thanks to the permanent magnet rotors, our electric cylinders feature a power increase that is five times faster than conventional pneumatic cylinders and maintenance-free thanks to its patented bath lubrication. Convince yourself! How does a linear motor work? A linear motor is a drive solution that differs from a rotary motor: Unlike a rotary machine, a linear motor does not generate rotating movement for the driven object. Instead, it moves the object in a straight line or along a curved track. A linear motor is used when the dynamics that a rotating servomotor achieves are insufficient and a direct translational movement (linear movement) has to be implemented instead. That is the case, for example, if applications have to be driven directly (linear motors) or involve precise adjustment processes (linear cylinders). The functional principle of linear motors is derived from the principle of rotary motors. Unlike in rotary drives, the active part that is supplied with a current is moved in a linear motor, while the electrically passive part remains in an idle state. In this case, "electrically passive" means that the magnetic field is usually produced by permanent magnets that can be arranged in any order. The reactive forces have to be absorbed by the machine base or the system. While rotary motors require transmission elements such as belts, chains, or similar to make a translational movement from a rotary movement indirectly, linear drives enable a movement and feed forces to be implemented directly. Linear motors are therefore referred to as direct drives. Linear motors can achieve very high acceleration (of up to 6 g) and travel speeds of up to 13 m/s (48 km/h). As a result, they are especially suitable for use in machine tools, positioning and handling systems, and machining centers. SEW‑EURODRIVE provides high-quality drive solutions with its practically wear-free and maintenance-free SL2 synchronous linear servomotors. The direct drives with convection cooling or forced air cooling are particularly well suited to handling tasks, pick and place applications, and synchronous processing. With us, you can purchase first-class linear motors that are an ideal match for your applications. 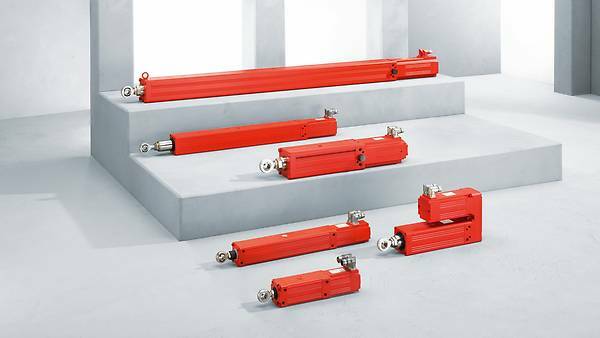 Linear or electric cylinders are variable electric aggregates that can move a rod out and back in a straight line. Electric cylinders are also a high-performance alternative to pneumatic or hydraulic cylinders. In electric cylinders, an electric motor serves as the drive. It is often a servomotor. In some cases, the motor is coupled with a gear unit; usually, however, the motor produces the movement directly through a threaded spindle. The spindle can be moved in and out through counterclockwise and clockwise rotation. Movement is restricted by the application itself and sometimes by a limit switch. Electric cylinders can be used for thrust forces and/or compressive forces. SEW‑EURODRIVE provides you with grease-lubricated and oil-lubricated electric cylinders in the CMS. series.. The patented bath lubrication provides the benefit of lubrication for life. There is therefore no need to re-lubricate the threaded spindles.